At my Final Exhibition I wanted to created an installation within the gallery and represent the site specific trees that I had created art around. To form a web of connection between the interior world and the exterior. The spice and pigment Mandala that I created was over three feet in diameter. I used the same materials that I use in my site specific work. At the show my greatest nightmare was that someone would walk through this work. I had visions of it as my great friends and musician (Frogwater) for that evenings daughter was dying to plough through it. The opening was a blur...I do remember going to show one of my artist friends Nicole Chan the work and gasped as I approached the destroyed Mandala. An old man fest up to it and said he had walked through it. What a test...what a night to let go and to embrace the impermanence of it all. 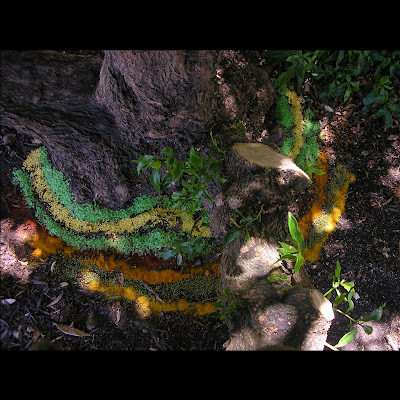 This work even in the natural world is really about impermanence, just like Tibetan sand paintings. It is gentle revaluation of the truth of our transitory existence. The destruction of this piece gave me an opportunity to create a ritual piece for our ancestors. The time was Halloween or Samhien and perfect. I went in the next day and resurrected this work. With red puja powder from India and peacock feathers. I made a call for fellow artists to bring rocks to honor their ancestors and to place them around the activated shrine. To create a circle of stones surrounding the interior.. This weekend was a great moment in my life. As a child I had always dreamed of receiving my M.F.A. I had fantasies of being an art professor that walked around this world with paint all over my clothes. Dreams come true. To receive an award was really not in my dream, but it made it even more powerful. I was compelled to honor this rite of passage with a tree shrine. I knew the perfect place, the meadow on the top of Mt. Tam, from this vista you could see north to the Ocean, Stinson Beach and south to the Golden Gate in San Francisco. Don and I hiked to the meadow on Sunday and saw in the distance a lone tree facing the extraordinary view. I instantly saw the red tail and I knew it was the place. This work was a bit of challenge because of the rocks the surrounded most of the trunk of the tree. Never the less it was a momentous. Don and spent the entire afternoon lounging under the tree in reflection and I in absorption at the completion of my personal rite of passage. I love how the image was like the micro and the macro. Within the rocks that surrounded the tree there was a minature forest. I guess it was not really a lone tree. On June 14th, I graduated with a M.F.A. in the Arts and Consciousness Program at JFK. It was an amazing weekend of celebration and ritual. Don flew up from a L.A. on Friday I was overwhelmed with emotion and connection to my fellow students at JFK's small gathering at the Berkeley Campus. On Saturday was the formal graduation and I was awarded the student of the year in the Holistic Studies Program at JFK. This is the speech the Dean gave to me-it was such an honor. Five years ago, you entered the Department of Arts & Consciousness as a student in the Transformative Arts program. As your creative process unfolded, your paintings grew ever more compelling. By the end of three years, you transferred to the MFA program to more deeply engage your artwork. During this period, you continued to develop a program in transformative arts for clients at the Lincoln Child Center in Oakland. Your program bridged the gap between art as a transformative tool and art as a form of cultural expression. Your Lincoln Child Care Center students exhibited their work in a Sausalito Gallery and were the focus of an annual benefit for the Center. Because of your dedicated and creative work with the students at Lincoln Child Center, they have experienced the invaluable joy of self-expression and the all-important process of being seen in their fuller humanity. You have been a profound, transformative influence in their lives. Salem, Witches, Haunted inns, the almighty dollar and "EARTH ART"
On July 7, 2008 I created my first East Coast shrine in Salem, Massachusetts the notorious place of the ‘burning times’ in U.S. This work was a memorial as well as a personal quest to foster reverence for the sacred feminine, which is the archetype of the Earth. I arrived in NYC on a red eye and there Don picked me up in our rental car and we were off for an adventure to Salem, Massachusetts,which was 4 1/2 hours away. The day was totally lucid for both us. The plan was to meet Cynthia a great friend from JFK in Salem Massachusetts to reconnect and to do some art. We arrived sychronistically at the Salem Inn when Cynthia did. I checked out our room 12 and it felt dark and creepy. Later we had found out it was surrounded by haunted rooms above and on both sides. It was strange Don and I instinctively went to the Peabody house instead, which was a yellow colonial from the 17th century. After our experience in room 12 we asked for a room in the Peabody house.There the energy was light and spacious. Don was totally intrigued and was a ghost hunter for those two days, asking everyone if they had an experience with the spirits at the historic Inn. It is a beautiful inn with impeccable service and it is really haunted by unsettled spirits. Salem is dotted with all these silly tourist traps. Over priced and kitchy to hilt.The shops were filled with cheap trinkets and the center monument was the lady from the TV show Bewitched. I felt unsettled and disappointed at the consumerism in Salem. It seemed like any other tourist town with a catch of history that they exploited. Were had the real roots of this place gone? " How and why does materialism, consumerism make a tragic event feel like a Ripley's believe or not?" as my friend and co-founder of Art is Moving, Lauren shared a similar experience that she had in small town in Spain where there was a torture museum that displayed the methods and horrific tools used in Inquisition . In the tourist traps of Salem, I felt uneasy and I was really unsure of where and if I was going to do my Art. The next day we went to the Willows park which is right on the bay and I saw my tree. It was far in the distance..and isolated from the carnival like crowd. As I approached it is was a lone maple tree steps away from the edge of the coast. The gross and some what symbolic thing was it had a used sanitary napkin at its base. I say that because there was garbage all over this park. This was an experience I have seen at many sacred sites around the world. At the Hill of Tara in Ireland, the most sacred passage called weirdly the mound of passages, was littered with garbage. Symbolic? I removed that and Cynthia who was videoing me said it was anointed by menstrual blood. Earlier Cynthia had created her own eco-art, a spiral with rocks on the beach. While she was creating I was moved to collect mussel shells to incorporate into my composition. The tree shrine that I was creating was a crescent,lunar one and the mussels also symbolized the feminine connection to the ocean, which is said to be the womb of the world. As I connected with the tree I remembered an amazing dream that I had were I was led to the world tree and there I had created a shrine. Afterwards, I laid underneath the tree, starring into the heavens- through the branches of the eternal in Ahh.. I hope my shrines will help build awareness of our spiritual connection with the environment, and that they will help foster reverence for all life. if you actually stubbled upon one of my shrines shoot me a line or if you have comments I would love to hear your response. This was a beautiful trip and art adventure. We took many modes of transportation to get to our destination. We left the Bay Area on March 20, 2008 taking mass transit BART to SFO and took a plane to El Paso,Texas. We changed planes in Salt Lake City it was magical as we boarded the small craft to view the snow covered mountains with the sun and the moon in the sky. We then arrived in El Paso and took a cab across the border to Juarez, Mexico. There we hopped on a bus to Chihuhua, Mexico for six hour bus ride into the heart of Mexico. In Chihuhua we hopped on the famous train called El Chepa, which would take us into the copper canyon. We decided to take the local train as that would be more interesting, than the tourist train, which was filled with elderly, white middle class Americans. We sat next to a beautiful Raramuri family. The Raramuri are the indigenous whose home is in the Copper Canyon. (more on them later). We got off the train in Creel and then rented bikes and rode into the Canyon, where I created this earth art. Trickster dog, checking out my art. All of sudden I look up and this dog has been watching me create for sometime. Raramuri women, creating in the distance from my own work. The English word for this area was Mushrooms and Frogs as the monoliths resembled them. Beautiful ancient Raramuri basket weaver. She reminded me of the tree. Down the road from my Earth Art was an old mission. There was a beautiful child there. I love the aesthetic of the Raramuri's.. the amazing colors that they wear. Walking Art...Art is life! More later on this project. The forest is a peculiar organism of unlimited kindness and benevolence that makes no demands for its sustenance and extends generously the products of its life and activity; it affords protection to all beings. 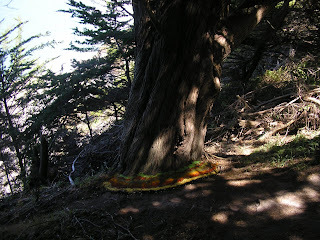 This tree shrine was created in San Francisco on the cliffs above the Pacific Ocean. My intention was to do a lunar shrine around a tree, when I use to live in this area I would meditate at, that looked like a lynx. Unfortunately, when I got there, it had been cut down. I had to find another tree. The tree that I choose was on the edge of a cliff. So I had to be careful. 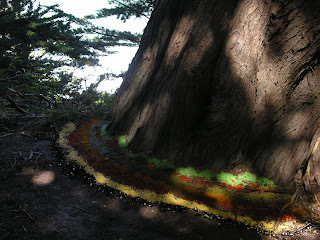 Once again, I took organic pigments and created a series of half circles around the base of the coastal redwood. For me this last ritual was the most powerful. Creating with the melody of the ocean and the wind filled my being with light. I sat with the tree for hours, and as I documented my earth art I felt very content and present. When I look at this artwork (all of my tree shrines) as a whole, I think about the space that is connecting these trees. That space is vastly filled with water. When I place the location of my earthworks on a map, the points create a rectangle. The solar and lunar shrines merge through the waters of the Bay. The lunar shrines merge through the ocean and the solar shrines merge through the earth. My hope is to build a relationship with these individual trees, as well as create a collective relationship among them. Just like humans, trees are community beings. My network has expanded as I have crossed coasts and countries, my web of relationships is growing stronger. 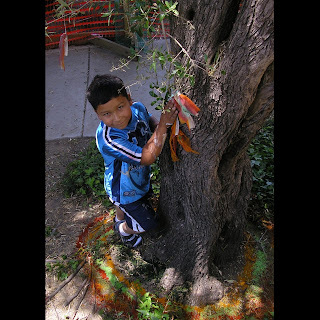 My third tree shrine was also collaboration with children at Lincoln Child Center, Oakland. LCC is a mental health agency for traumatized and abused children, where I teach transformational art. My vision for this artwork was to create a solar wishing tree shrine. The tree that we choose was a neglected olive tree, located on a small island of dirt surrounded by cement. Jasmine, my student and I poured beautiful pigments and contrasting hues to activate the energy in the concentric circles at the base of the tree. Then we tore Sari cloth into ribbons and asked the other children to make wishes as they tied it to the tree. It was quite magical as the children intuitively asked permission from the tree and made wishes for world peace, to go home, not to be restrained anymore and so on. It so was enchanting when little Sara animatedly bowed down to the tree like Buddhist monk. The wind blew through the tree with the simplicity and the majesty of Tibetan prayer flags. In months later I had numerous enchanted students running up to me telling their wishing did come true!! A tree uses what comes its way to nurture itself. By sinking its roots deeply into the earth, by accepting the rain that flows towards it, by reaching out to the sun, the tree perfects its character and becomes great. ... Absorb, absorb, absorb. That is the secret of the tree. The first shrine that I had created was part of my neighborhood mapping practice for a class called Artist in Society that I was taking in my Graduate program at JFKU in Berkeley. Its premise was to look at our relationship with Nature and how does it integrate or not into our art and process. The most powerful being in my neighborhood is the majestic redwood that resides outside my front door. During my morning ritual, which includes lots of coffee and lots of staring, I always open the door and gaze up at the giant and greet him with great admiration, over the years I have named him grandfather. Also at the summer and winter solstices I celebrate his presence by burning incense and candles at the base of his truck. To me this amazing tree embodies strength and divinity. This project has given me an opportunity to do art for the tree. Normally, he is a witness in my creative process and in this realm I feel he become an active participant. It began with a trip to my favorite Indian store called the Indian Bizarre in Berkeley. Where I bought and array of spices and Puja powder, which is a vibrant red pigment used in traditional Hindi rituals. As I opened the gate and walked down the path into my yard, I gasped in sadness as I saw a brilliant yellow and red bird lying dead in my path. I looked around for my three felines kids, to see if anyone was guilty. I immediately buried the bird with honor, but as I started creating the shrine I wanted to resurrect it. Was it a sacrifice? I started creating the solar shrine, by circling the base of grandfather’s truck with the spices and pigments. I then created a series of concentric circles around the base of the tree. The pigments I intuitively placed creating a vibration between the contrasting hues. In a smaller concentric circle I embedded two power objects in the earth from various parts of world that I have been to--- a rock from the Irish Sea and a crystal that I received from a Shaman in Peru. At twilight I lit candles and placed at the four directions in the smaller circle. Lastly, at this time I documented the earthwork with photography. Something weird began happening while I creating the shrine, honeybees had started dive-bombing into the assemblage and dying. In the morning the bees had gone crazy and were swarming in giant spiral in my yard. Instinctively I knew to dismantle the shrine immediately. Shortly, after that the bees went back to normal. It seemed from their response that I had evoked something while creating the shrine. Unfortunately, it seemed disharmonious. Was it the bird? I destroyed the work like a Tibetan sand painting, leaving only in the earth the stone and crystal. Within the process of mapping my neighborhood I have seen in the garden a luminous blue dragonfly continuously landing on the stone. For me it symbolizes the shrine is still active. This was my fourth Tree Shrine. The Marina is a beautiful place with a breath taking view of the Bay, were you can see San Francisco, the Golden Gate, and Mt Tam in one deep breath. This is were I go regularly to run and meditate. It is place of peace and solitude for many. I choose this tree because is was mutilated. I was curious why several of the trunks of the tree had been sawed off. It seemed wounded. It was a great day of ritual, reflection, and reverence. Strange though I went back the next day and my site was roped of like a crime scene?? That was disturbing. 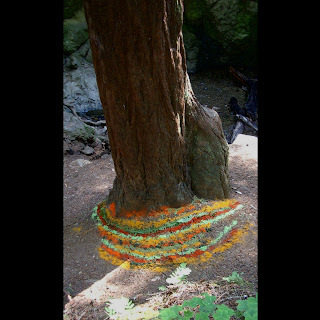 The second shrine that I created was a lunar shrine across the Bay at the base Mt Tam in Marin County. It was mothers day weekend and I had invited my good artist friend, Billy to collaborate with me on this one. As we were hiking we ascended a hill and we were amazed at what we saw. It was picturesque. Two young redwood trees had framed a brilliant waterfall. Two elements were necessary in creating this lunar shrine, the first was that the place had to be near a water source and the shape of the shrine was to be in the form of a crescent that would surround the base of two trees. This time the medium that I used was spices and pigments from the Asian market. Again organic pigments were intuitively and meditatively placed in half circles creating crescent shape. While my friend and I created our lunar shrines, several women with their small babies kept gravitating onto the scene and inquired what we were doing. I am not sure whether it was it synchronicity or coincidence, but something was happening beyond the ordinary. We both looked at each other and mused that our lunar shrine must be working. It seemed to be attracting mother energy. 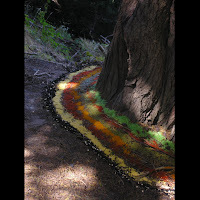 My earthworks are collaborative installations that pay homage to trees in and around the Bay Area that emanate power or have an absence of it. It began as a practice to rekindle my ancient relationship with trees. Evidence of human kind’s interconnection with trees traces back well over 6,ooo years. Humanity once had a deep spiritual relationship with trees. Indeed, the precursor to our dominant patriarchal religions was the tree. My work is a cross culture phenomenon inspired by the Kalaptura tree (wishing tree) of India and by various ancient and indigenous cultures around the globe that worshipped trees. While creating these works metaphysically, I activate my belief in animism ---- the shamanistic worldview that bodies in nature have souls and consciousness. Thus far I have created eleven earthworks, five being solar and six being lunar. The solar or circle shrines symbolize the archetype of the masculine. The crescent or lunar shrines symbolize the archetype of the feminine and must be created near a water source. 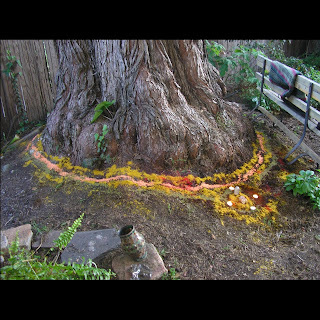 I employ these two energies through the intuitive action of creating concentric circles around the trunk of a tree with pigments, spices, and food from Asia, India, and South America. 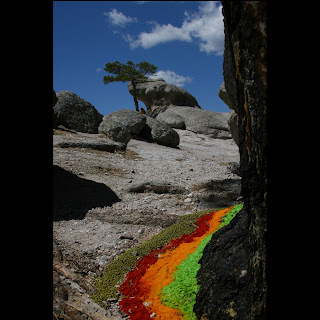 The inner rings of the tree seem to exteriorize and vibrate with energy through the vibrant and contrasting colors of the pigments. After each work is complete I meditate with the tree and document my experience. An important aspect of this project is the witnessing and of the interaction of the work by another to activate its potential for the witness to remember something they have forgotten. My intention is for my shrines to evoke introspection and a sense of the sacred for those who stumble upon them in a forest or in a city. One of my latest tree shrines was a solar shrine created at Lincoln Child Center, a mental health agency for abused children where I teach transformative art. It was a collaborative project with my students. The tree we chose was a neglected olive tree located on a small island of dirt surrounded by cement. We poured the pigments and contrasting hues to activate the solar energy in the concentric circles. Then we tore Sari cloth and ribbons and asked all the children to make wishes as they tied the ribbons to the tree. The children intuitively asked permission from the tree. One child wished for world peace. Another wished to go home. A third wished he would not be restrained anymore. The wind blew through the tree with the simplicity and majesty of Tibetan prayer flags, carrying my students’ wishes away. My earthworks are expanding internationally. I have decided to create shrines around the globe. In March of 2008, I went to Copper Canyon in Mexico and I created a shrine in around a tree located in a place called “the valley of frogs.” From afar, I noticed several people looking at the shrine with curiosity. I hope my shrines will help build awareness of our spiritual connection with the environment, and that they will help foster reverence for all life. "The tree which moves some to tears of joy is in the eyes of others only a green thing that stands in the way. Some see Nature all ridicule and deformity, and some scarce see Nature at all. But to the eyes of the man of imagination, Nature is Imagination itself. This is a place were I mediate and I wanted to ritualize my experience. It is a reflection of how many times I have sat on this stone facing the Bay in a state of Being. The mandorla is the term used in sacred geometry when two circles merge and the in between is one. Gradually, the trees were reduced from living spirits to little more than timber sources. Some of the ancient lore was passed on by oral tradition through a long line of country folk, albeit sometimes in a Christianised form to make it more acceptable to the 'authorities'. Much of it is missing, as is the case with the Beech. The only way we gain regain what was lost is to stop thinking of trees as merely timber and amenity. All the world would benefit if we are able to relate to trees fully once more: as our friends, our providers, our healers. But especially as creatures who have their own lives to lead and their own role to fulfill in the community of Earthly beings. Once we understand that, we will hopefully stop sabotaging their many contributions, and work side by side with these giant plants rather than merely exploiting them. 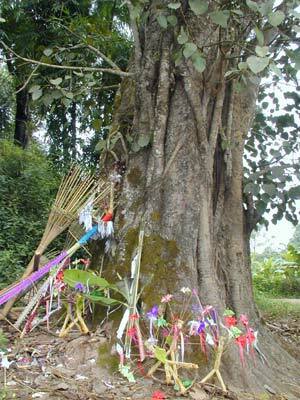 All the minorities of Xishuangbanna, China including the Dai minority, are nations of the forests. From ancient times till up to the present, the forests are the basic material and environment conditions for their survival. Forests are the objects of their worshipping and their worshipping for forests also has close relations with their worshipping of ancestors. In such circumstances, in all the villages and the unit above villages, they at least keep one piece of forest, which is called "Longshan wood" (village wood). I love Nepal I traveled there in 1996. It was a life changing experience. I spread my Mom's ashes there after seeing an amazing image of the Green Tara.